Cortney Bogorad says an innocent trip to the bathroom ended with public humiliation and injuries from being physically thrown onto the street by a security guard. 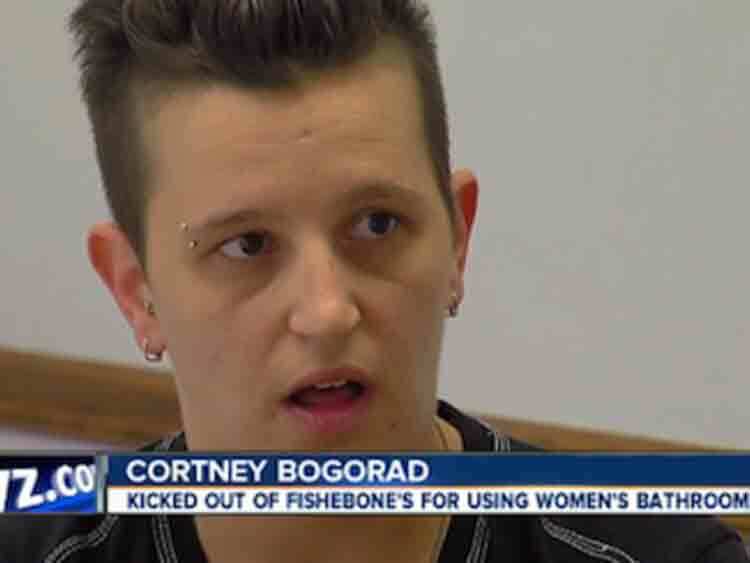 Cortney Bogorad wears her hair cropped short and is cisgender, meaning she is not a trans woman. She said after dinner, at 11 p.m. on January 23, she enterted the restroom at Fishbone's Rhythm City Cafe. She heard a voice yelling from outside — apparently from a security guard — that "whatever man is in the restroom needs to come out now." Bogorad said she ignored him because she did not realize she was the "man" the guard sought. This is when the situation got scary, said Bogorad. The guard allegedly entered the bathroom yelling, "This is a woman's bathroom, if you are a man, come out!" and pulled Bogorad by the arms out of the stall when she opened its door. She said he then pushed her up against the wall, saying "boys aren't allowed in this restroom," according to the Detroit Free Press. "He was much bigger than me, at least three times my size," Bogorad told WXYZ. In her lawsuit, she explained that she and a friend informed the man repeatedly that she was a woman, and offered to show her legal identification stating that she was female, but the guard refused to see it, instead shouting inches from her face, "Get out of the women's restroom!" According to Bogorad, the guard then pushed her out of the bathroom where she saw a person she thought might be a restaurant manager. When Bogorad tried to explain to the man that she was a woman and show him her ID, she said he, too, ignored her efforts to prove her identity. The guard allegedly then took his security badge, and holding it just inches from Bogorad's face, yelled that he was a security guard. When Bogorad pushed the badge away, that's when she said the guard picked her up "against my will" by the shirt and bra. He then "aggressively" pushed her to the restaurant's front door, exposing her "upper torso" to other customers, and threw her out of the resturant onto the street outside, causing physical injuries, Bogorad said. Her lawsuit, filed at Wayne County Circuit Court on June 10, is seeking $25,000 for physical and emotional damages, battery, and gross negligence. "This could have happened to anybody," Bogorad told WXYZ. "There's lots of females out there who look like boys, but at the end of the day we're not." She added that she is suing in hopes that the same humiliating experience never happens again to another customer at a Fishbone's. Fishbone's has declined to publicly comment on Bogorad's allegations. As Bogorad's ordeal has become public, several trans advocates have this week pointed out that this year's spate of anti-trans "bathroom bills" would likely result in many similarly harmful situations for both trans and non-trans gender-nonconforming patrons in several states nationwide. Republican proponents of these bills seek to "deputize" businessowners as the "gender police" of their bathrooms, according to trans journalist Lexi Cannes. So far, Florida, Texas, Minnesota, Kentucky, MIssouri, and Nevada politicians have tried to push forward such laws in businesses and schools, but none has passed — and would likely face federal opposition if they did.